If you're planning a tasting party, it's a good idea to come up with a few wine tasting games before the guests arrive. These games help everyone get into the spirit of the event, especially if this is the first time some of the guests have attended such a party. 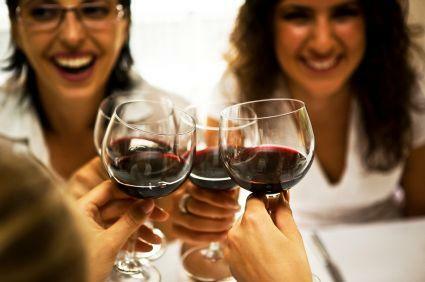 In recent years, wine tasting parties have become extremely popular with both wine connoisseurs and casual enthusiasts. These parties are a great way for everyone to experience new varieties of wine and learn fun facts about the wine varieties they already love. Wine-themed games are the perfect way to break the ice and get the guests involved in the tasting. Some people feel intimidated by the protocol of wine tasting, and games will put everyone at ease. This game is a good choice for beginners, as well as expert wine tasters. Depending on the experience level of the participants, the wine varieties can be radically different or quite similar. For instance, if you're hosting a group of beginning tasters, include sweet white wines, dry white wines, desert wines, dry reds, and blushes. If you're hosting a group of wine experts, limit your choices to one or two varieties from several different vineyards. Before the guests arrive, apply the blank labels to the wine bottles. Set out several plastic cups for each guest, and apply a label to each cup. Number the wine bottles, and put the corresponding numbers on the cups. Each guest should have a cup for each bottle of wine. Keep the bottles hidden. When you're ready to get started, give each guest a blindfold. Once you make sure no one is peeking, pour the wine into the corresponding cups. Give each guest the first cup, and have him or her taste the wine. Read off a list of the wines the guests are tasting, and have them write down their best guess for the variety. Repeat this process with each bottle. If guests want, they can go back and taste an earlier wine for comparison purposes. When everyone has tasted all the wines, take off the blindfolds and compare notes. The guest who identified the most bottles correctly is the winner of the game. One of the most important and often overlooked elements of wine tasting is the aroma of a bottle of wine. You can create a game around this concept by having guests compare some of the scents commonly found in great wine. For each ingredient, place a small amount in the bottom of a paper cup. Slide a sheet of plain paper over the top to keep it hidden. Invite each guest to put on a blindfold and try to identify the scent that is in the cup. The guest who correctly identifies the most scents is the winner of the game. If you'd like to purchase wine tasting games for your next party, you can find a variety of options at online retailers like Amazon.com. The games typically cost between $20 and $60. Tailor the game to the experience level of your guests. Make sure things are tricky but not too overwhelming. Offer prizes for the winners of the games. Some great options include a bottle of wine, a wine opener, or a book on wine. Have fun! There's no sense in getting too serious about wine games, so make no one gets too caught up in the competition.